Jason Stafford has nothing. He was once a top Wall Street trader living the high life, but after a getting in over his head with falsified profits and fraudulent trades, he finds himself at the end of a two year jail sentence with no money, an estranged ex-wife who has his only son, and seemingly no future job opportunities. You can imagine his surprise when the CEO of a large Wall Street firm asks Jason to investigate the trades of a junior trader who recently died in a boating accident. Intrigued by the prospect to work in his old environment and desperate for any kind of income, Jason accepts. As he begins to reclaim his professional dignity, Jason also is determined to gain custody from his alcoholic ex-wife. Jason Jr., nicknamed "the Kid", has been diagnosed with autism and is not getting the care he needs. With his ex just as unstable as his son, Jason is shocked to learn that the Kid is locked in a room all day. Risking his parole, Jason flies to Louisiana to retrieve his son. When he returns to New York, son in tow, Jason is forced to reevaluate his life, and learn to live with his unique son. Meanwhile, Jason's investigation is revealing a larger conspiracy than even he expected. As he digs deeper into the web of fraud he attracts the attention of Wall Streets power players as well as agents from the FBI. When he uncovers a system that will certainly rock the entire financial institution, Jason must decide what to do with the information. If he makes the wrong decision, it could cost him his life. With this excellent debut novel, author Michael Sears enters the thriller genre with a bang. His knowledge of Wall Street brings a unique perspective to the story. This timely tale of financial deceit flows at a perfect pace, never getting bogged down in the details that are presented. While the thriller side of the story is entertaining, it is the father-son relationship that really places the novel on a higher level. Jason's adjustment to becoming the guardian of his autistic son is the secret to this story's success. Sears subtly crafts the two characters, making the reader truly care about the son and root for the Father's redemption. I will admit that the secondary characters were not as strongly conceived as Jason and the Kid, but the focus on the two far outweighed the lack of development in the others. 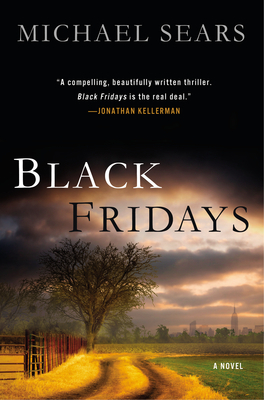 Overall, "Black Fridays" is a thriller with heart that I highly recommend. This entry was posted on Friday, September 21, 2012 and is filed under Autism,Black Fridays,Book Review,Conspiracy,Family,Finance,Michael Sears,Mystery,Suspense,Thriller. You can follow any responses to this entry through the RSS 2.0. You can leave a response. I also liked this book (http://manoflabook.com/wp/?p=6600) and thought it was a wonderful debut novel. Thanks for your comment! It seems we both enjoyed this novel for the same reasons. I didn't realize that this was meant to be the start of a series. It will be interesting to see how the relationship develops in upcoming books. Great Review! I look foward to reading this book!